Learning how to setup a WordPress blog can be confusing for beginners and experienced bloggers alike. WordPress is relatively simple to install and begin using, but configuring the settings, tweaking the functionality and selecting plugins can be overwhelming. This step by step guide is meant to teach you how to install, configure and secure your WordPress blog. 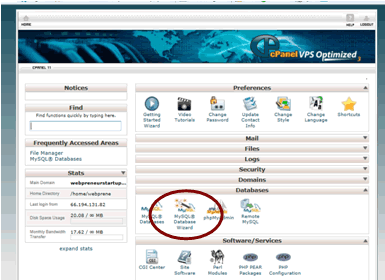 In this first part of the guide, you will see how to install WordPress and configure some basic settings. In the second part of the series, you will learn how to configure some more advanced settings, choose a theme, and select and install recommended plugins. There are two main options for installing WordPress: one click install and manual install. If your hosting providers supports a one-click installation for wordpress (through Fantastico De Luxe or other methods), this will be your easiest approach. The one click installation will take care of setting up your databases and loading the WordPress files. If your hosting provider does not provide a one click install or if you prefer to manually install WordPress, follow the steps below. Step 1: Download the latest WordPress files from http://wordpress.org/download/ to your local computer. Unzip/extract the files. 2.2.4 Record the hostname, username, databasename, and password you chose – you will need these values later. The wp-config.php file contains information specific to your unique installation. To create this file, make a copy of the wp-config-sample.php file that you downloaded earlier and rename it wp-config.php. Open this file in a standard text editor (like notepad) and locate the MySQL settings section as shown below. Replace the database_name_here, username_here, and password_here with your database name, username and passwords that you created in step 2. The other values for hostname, db_charset and db_collate should work as is. The final piece that you have to change is to enter unique authentication keys. To generate these keys, go to the online generator at https://api.wordpress.org/secret-key/1.1/salt/ and use the output generated to replace the corresponding section in your wp-config.php file (as shown below). The final step is to upload all of the WordPress files into the root directory of your domain. I use FileZilla as my FTP client, but there are plenty of other options available. Once the files are uploaded, go to the site http://www.yourdomain.com/wp-admin/install.php to run the WordPress installation script. The installation screen will ask you to enter your site name, your site title, your user name, your password, and your email address. You will also be asked whether you want your site to be visible to search engines. I leave this last option unchecked when I am starting a new site from scratch, it is very easy to change once your site is ready to go live. That’s it! You should now have a working site that is ready to be tweaked and optimized as shown in the following steps. There are a variety of settings that you should modify in WordPress to help with search engine optimization and usability. The Permalinks control how your site’s URLs will appear. For SEO and usability you will want to change from the default setting (i.e., www.yourdomain.com/?p=123). To make this change, login to your WordPress control panel using the username and password you chose. Select Settings>Permalinks and choose “Post-name” as your preferred Permalinks setting. Your URLs will now appear as www.yourdomain.com/your-post-title. Attempt to notify any blogs linked to from the article – Yes. This is recommended, because other WordPress blogs will be notified if you link to them, which may result in more traffic to your blog. Allow link notifications from other blogs (pingbacks and trackbacks) – Yes. Similar to above, this option will notify you of links from other WordPress blogs. Allow people to post comments on new articles – Depends. This one depends on the purpose of your blog, and your ability to manage comments. Personally, I believe that you should foster comments on your blog because they add to the discussion/interactivity of the blog and can help from a SEO perspective. Comment author must fill out name and e-mail – Yes. Requiring this can help reduce the amount of span. Users must be registered and logged in to comment – Probably not. For most blogs this is unnecessary. Automatically close comments on articles older than  days – Depends. This is intended to help you manage your comments by not having to actively manage comments on older articles. Enable threaded (nested) comments  levels deep – Yes, with caveats. This is a personal preference, but if your theme supports nested comments, then can help in encouraging discussion. Break comments into pages with  top level comments per page and the [last] page displayed by default – Yes. Preferred setting, especially for blogs that receive hundreds of comments per article. Comments should be displayed with the [older] comments at the top of each page – Yes. Anyone posts a comment – Yes, initially…until you start getting too many comments. A comment is held for moderation – Yes. Users will want to have their comments approved as soon as possible. An administrator must always approve the comment – Yes, initially. Until you become more comfortable with your users/blog and anti-spam tools. Comment author must have a previously approved comment – Yes. I recommend this approach. Once I have approved an author’s first comment, then I do not have approve any subsequent comments. Try this approach and see if it works for you. In this first article, I showed you how to setup a WordPress blog by manually installing it and configuring some settings. Part 2 of this series will teach you how to set your ping settings, set up a fireburner feed, select a theme, and install recommended plugins. Thanks for the detailed setup instructions. Didn’t understand what some of those settings meant.